The trees used on Valhalla's plantations are genetically pure. No grafting is performed. 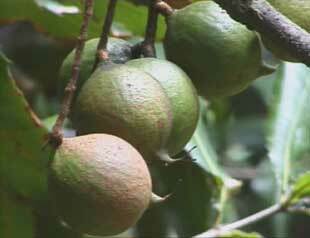 We have been selecting for a better tasting, better producing macadamia nut for 70 years. According to UN reports we have lost 75% of the gene pool in our food crop in the last 100 years. It is for this reason that we are working to preserve the genetic diversity of the macadamia species by not grafting or interfering, and therefore, our trees and their fruit qualify as products of truly sustainable agriculture..
All of the trees at Valhalla were grown straight from the seed, without grafts. This means that every single tree at Valhalla is a unique individual with unique genetics. The trees at Valhalla have been selected because they perform well in this particular place. Because they perform so well here, we have no need for chemical or organic fertilizers or pesticides. Conventional plantations rely upon grafting techniques to ensure uniformity or positive characteristics as far as production, size and appearance are concerned. A graft is a branch, cut from an exiting tree with known characteristics, which is then literally stuck onto a rootstock, which is a tree onto which the graft will be made. The resulting fruit and seed from this plant will have the same genetic code as the parent tree. A grafted plantatioon is a plantation of clones, through which a disease, pest or fungus would find it much easier to spread, which in turn leads to the almost obligatory use of pesticides or fungicides. By not grafting our trees, we preserve the natural diversity of the species, which allows to control pest and disease naturally, without spraying anything. In nature, this diversity protects species like ours from disease. By being genetically unique, humans are able to react individually to a flu virus, for instance, making it difficult for it to spread. IN the same way, our trees unique genetic code enables us to cultivate them without spraying anything at all. We select our trees by putting the seeds (or nuts) under stress as they grow into seedlings. The hyper-competitive environment our seedlings grow in make it easy to tell the strongest and highest producing from the weaker individuals. The stronger individuals are then used for nut production. By doing this, we can quickly determine which trees grow best in a new environment. This technique will be used to find new individuals that will survive in any new regions the Valhalla project expands to. The problem with grafting is that it has severely reduced the gene pool for many of our common fruits. For example, Red Delicious apples are all genetically identical. Golden Delicious, a different variety, are also all genetically identical. While the genetics of these trees remain the same, the pests and diseases that attack them are constantly evolving. Thus, more and more chemicals are required to allow these varieties to grow. Genetic uniformity could potentially lead to the loss of entire species of common fruits and vegetables. Bananas, for example, have such a high level of genetic uniformity that some fear a present disease could eliminate this crop from the planet.